"Yes, your new cat and dog can get along; as long as you make the proper introductions!" 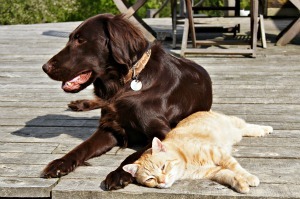 Your cat and dog can get along. And, of course, you hope your new kitty and resident dog will get along. However, some human intervention may be required to get things off on the right foot. Some cats may already be used to being around dogs and vice versa. You won't know how this particular cat and dog will get along, so it's best to play it safe and keep them separated until you are around to supervise. You should set up a safe place for your new cat before you bring her home. Let her get comfortable in her safe space and then let her get used to the rest of your home before you introduce her to your dog. When you think your new cat is comfortable in her safe place, allow her to explore the rest of the house without your dog there. Let her get used to your home and start to feel that this is her territory. The more comfortable and familiar with her new territory she is, the easier it will be for her to handle a potentially stressful situation, such as meeting your dog for the first time. When it seems that your new cat is comfortable in the rest of the house, it's time for her to meet your dog. Make sure this visit is supervised and that your dog is on a leash. It's essential that your dog knows basic obedience and is under control for the first meetings. One of the best ways for your cat and dog to first meet is when your cat is on a high surface that your dog cannot reach. Bring your dog into the room on a leash and watch out for any aggressive behavior. If your dog seems to be doing OK, but your cat seems nervous or threatened, it's time to let her retreat to her safe haven until she gets a little more comfortable and seems willing to try meeting your dog again. But if things seem to be going OK, you can let your dog walk around (on leash at all times). As long as your dog is on a tight leash, your new cat can approach your dog if she wants and can also have an escape route. Make sure she can get easily back to her safe space. It will be normal for your dog to be curious about the newcomer, but if your dog lunges, snarls, growls, bares her teeth, or exhibits other aggressive behavior, then the animals should be separated. This behavior is considered serious enough that one local S.P.C.A. says that the cat is better off being returned to the S.P.C.A. I hope this isn't the case for you, but it's always best to do whatever is best for your animal companions. If your dog barks or tries to chase your cat, you should correct your dog immediately. He needs to learn right away that these behaviors are not acceptable. On the other hand, if your new cat bats your dog on the nose as a warning, this is acceptable behavior and should not be discouraged (aahh, the advantages of being a cat). This is a sign that they are setting up boundaries and working out their relationship. It's a good thing. Be sure to reward your cat and dog for any friendly behavior and encourage their positive interactions. Just as when you are introducing your new cat to another cat in your home, it's important that the visits between your cat and dog are supervised and only last for about a half an hour to start (less, if things aren't going well). Then separate them until you can supervise the next visit. Don't rush it or you could set back their progress. Use your best judgment to decide when it will be OK for your dog to be off-leash with your new cat. Let your cat set the pace and reward them both profusely for their friendly behavior and interactions. Although it's usually easier to introduce a kitten and dog, it's still possible for an adult cat and dog to get along. Mind you, they may not always become the best of friends, but they can learn to live in harmony. It's recommended that you not leave a kitten under four months old alone with a dog. The kitten needs to be able to defend himself should the need arise. Four months is a general guideline for leaving your kitten alone with your dog. If it seems to you that your five- or six-month old kitten cannot yet defend himself, then don’t allow him to be unsupervised with your dog. Cat Names How to choose a name for your new cat or kitten. Didn't find what you were looking for? Use the Google Search Box for more feline information.